The members of class Agnatha are startling to look at. Long and eel like, but lacking jaws they can appear faceless and lifeless. 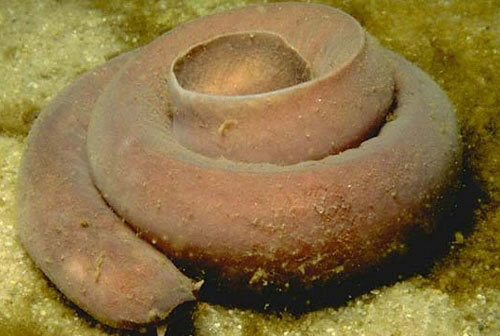 Hagfish, for example, look more worm-like than fish-like. They have no mouth, no eyes, no fins and not much of anything else belonging to a typical fish. But they are fish, and some of the deep oceans most able scavengers. They can be found in both the Atlantic and Pacific oceans, where they live at depths of 100 to 3,150 feet. They will play the role of decomposer, depending on their sense of smell to find food. Hagfish can also invade the bodies of sick fish by entering through their mouths and settling in their stomachs (Gross huh?). Once lodged inside, they can eat their hosts from the inside out. Hagfish are sometimes called “slime hags” because of their ability to produce copious amounts of slime. This slime protects them from the digestive juices of their hosts. The slime also is a great deterrent for potential predators. Click here to watch a video of their slime making capacity (or if you prefer the YouTube Version). Lampreys are the closest living ancestors to Hagfish yet they live very different lifestyles. Lampreys are all parasites. They attach themselves to fishes, latch on with their teeth, and secrete an anticoagulant into their hosts blood stream. Just like a leech or a mosquito, this keeps the fish’s blood from clotting and allows a lamprey to drink their victims blood. Sometimes a lamprey will kill its host, other times it will detach leaving its host wounded, but alive. Much like salmon, adults spawn in freshwater. Young lampreys will make their way into saltwater as adults, returning only when they are ready to reproduce themselves. At least one species of lampreys have become landlocked in the Great Lakes where they have caused significant damage to the sport and commercial fishing industry. The class Chondrichthyes includes all sharks and rays. To most untrained eyes sharks and rays look nothing alike. With the noticeable exception of ray’s kite-like body and mouth underneath instead of in front of their body, sharks and rays are structurally very similar. All members of the class Chondrichthyes have a skeleton made of cartilage rather than bone. This is useful because cartilage is lighter and more flexible than bone. 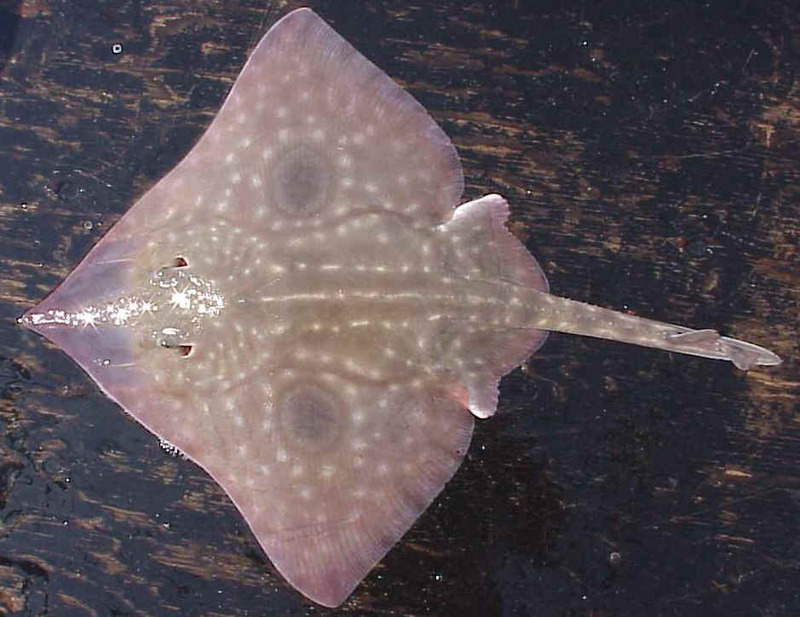 Chondrichthyes lack an air bladder, which means they have a natural tendency to sink. As such, most sharks have pectoral fins that are shaped and function much like airplane wings. Water moving over their fins, gives them lift. Rays’ wings are nothing more than over-sized pectoral fins, and also serve to provide lift while swimming.Most sharks and rays have five to seven gill slits instead of the one that their cousins, the bony fish’ have. Almost all sharks and rays have a movable jaw and well developed teeth. 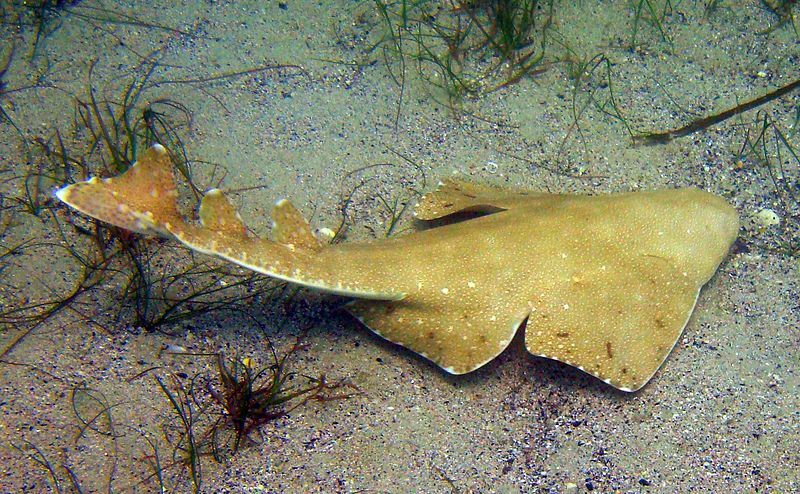 Sharks and rays have placoid, or hook-shaped scales that give them a rough and armor like skin. There are several hundred shark and ray species that inhabit all of the oceans habitats. Ampullae of Lorenzini – The AOL are tiny pores on the bottom side of a sharks snout. Water can penetrate into these pores, allowing the shark to detect tiny electrical pulses that are created by the muscle movements of other fish. Lateral Line – Similar (in some respects) to the Ampullae of Lorenzini, the lateral line is a row of pressure sensitive pores that run the length of the sharks body. The lateral line allows the shark to orient to particle movement or sound. It consists of structures called neuromasts which are located in canals that lie just below the surface of the skin or the scales. Sharp Rough Skin – Sharks and rays also share the same kind of skin: instead of scales, they have small tooth-like spikes called denticles. The spikes can be so sharp, in fact, that ocean going cultures have long used shark skin as sandpaper. Teeth – Thanks to the movie “Jaws,” sharks are known for their teeth, but no two shark species has exactly the same teeth. As such, teeth or bite marks can be used as an identifying characteristic of individual species. Those huge, triangular teeth familiar from Jaws have serrated edges that equip the white shark for cutting into a fare of seals, sea lions, porpoises, and even sea turtles. Other species will have teeth that are more pointed and spear-like, which are much better adapted for grabbing than for cutting. Not all sharks have teeth. In fact, there are several shark species (like the basking shark pictured to the below) that are strictly filter feeders. Sharks, for the most part, are sexually dimorphic and reproduce using internal fertilization. Male sharks have claspers. It’s one of the ways you can tell male and female sharks apart. Claspers are used to deliver sperm to the cloaca of a female shark. Shark fetuses develop internally, but there are some sharks that will lay unusually shaped egg cases. If you want to know more about shark reproduction, and how strange it can get, read “50 Shades of Grey Reef Shark” from the marine science blog Southern Fried Science. Sharks are especially vulnerable to habitat destruction and fishing pressure, because they have slow rates of maturation and low reproductive rates. Sharks are unusually long lived and give birth to a relatively small number of young when compared to other types of fish. Many species breed only every other year and have gestational periods as long as thirteen months. Sharks are often caught as bicatch by tuna fishermen using long lines or drift nets. However, for the last 30 years sharks, have been increasingly targeted for their fins. Sharks can be eaten (some are very tasty), but most are taken only for their fins. Shark fin soup is a very popular (and very expensive) dish served in many Asian countries. With no jaws, explain how lampreys and hagfish eat. Explain how hagfish can use slime as defense against potential predators. This YouTube video may also help. Anatomically speaking sharks and rays are really more alike than they are different. However, they use their bodies very differently. Watch a video of a manta ray swimming and a hammerhead shark swimming. Describe the difference. Examine the picture at the very bottom of the page. Then go to the Shark-O-Matic to identify what species of shark this is. Click here to read about this shark and to check your answer. How would you describe this sharks feeding strategy? Whale sharks and basking sharks are the largest of the sharks. Yet they feed on the smallest of prey (plankton.) Watch either video and describe in your own words what this looks like. We often consider salmon sharks a “local species” in South Central Alaska. Yet, in the winter salmon sharks travel great distances. Where do salmon sharks go after a summer spent in Prince William Sound? This page may also help you. Check out this video captured by an ROV from the Monterey Bay Aquatic Research Institute in 2009 of a Chimaera. Read the article that goes along with it and tell me one fact you found interesting about this ancient shark, or tell me one things you found in the video that you enjoyed about the video. How is the conservation of sharks connected to the health of Australian coral reefs? In 2010 about 60 people were killed world-wide by sharks. In the same year, estimates are that people killed 73 million sharks. The hunter is now the hunted. Use the two following links to do a little research, then explain why the survival of sharks is increasingly under threat. Global Shark Conservation / Bite-Back-Shark Conservation. Read the attached article about tracking great white sharks. After reading the article, use the ocearch.org shark tracking app to track a shark. Pick a shark, tell me its name and species, and then tell me where the shark has been during the time it was tracked.